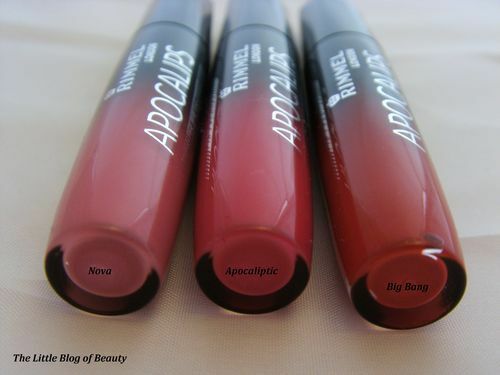 I don’t think I own any Rimmel products (apart from maybe a couple of nail varnishes) and despite the hype within the blogging community regarding the release of Apocalips, I wasn’t really intending to try any. I sometimes find myself chatting away to my boyfriend about new products that are coming out or things I’d like to try before I remember that half the time he has no idea what I’m talking about! 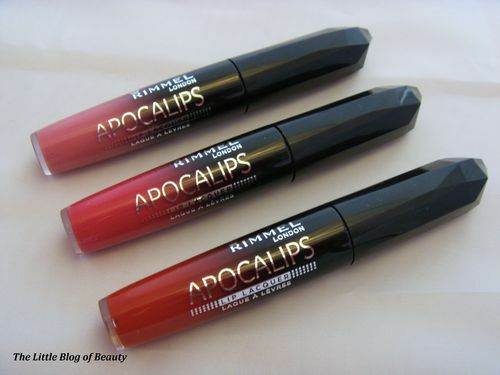 I had mentioned that Rimmel were bringing out a new product and he must have been listening because when he came back from running an errand in town one day he surprised me with three Apocalips. Obviously I didn’t get to chose the colours myself because I didn’t know he was going to get these but I was very pleased with his choices of Nova, Apocaliptic and Big Bang. The only other colour I think I might have considered myself was Stella. 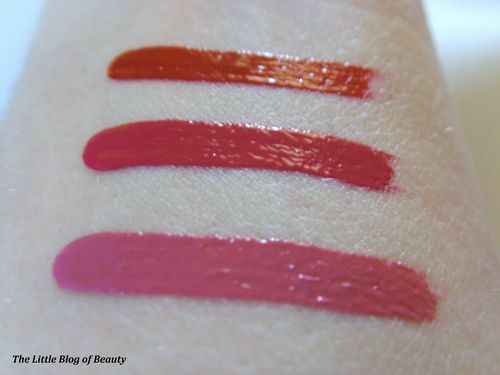 I’m sure I don’t have to tell you too much about these but they are described as a lip lacquer combining the colour intensity of a lipstick with the shine of a lip gloss. 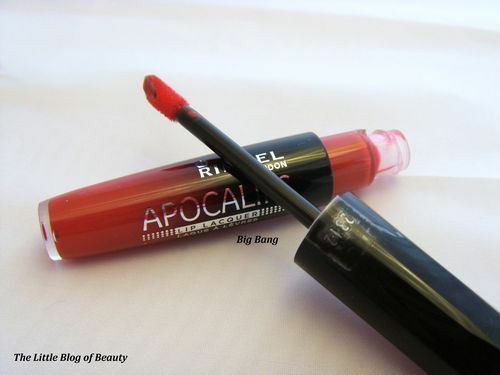 I really like the packaging, the lid is an unusual shape and quite eye catching and I love the way the black colour scheme fades out becoming clear at the end of the tube so you can actually see the shade inside. 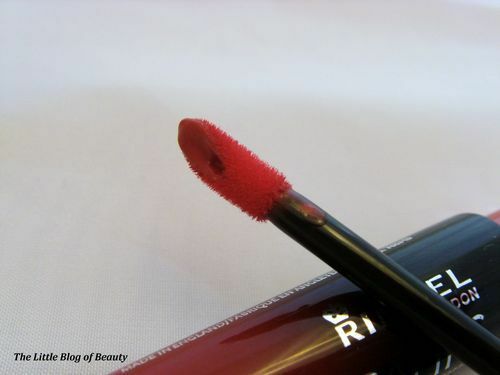 This has a really good doe foot applicator that makes it very easy to apply and has a hole in the middle which holds just the right amount of lacquer to cover your lips. 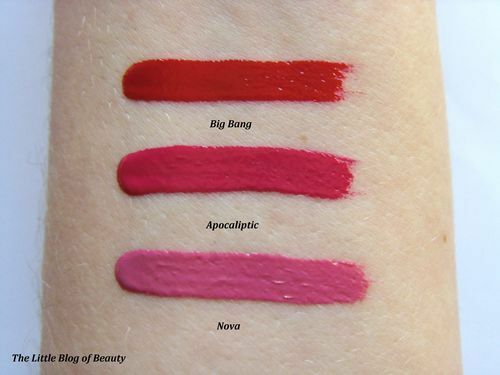 With regards to the shades I have, Nova is a quite deep pink colour, Apocaliptic a much brighter and deeper rosy pink/red and Big Bang is a full on red. In the past I really haven’t bothered with lipstick very much apart from the red required for being on stage, but this year really is going to be the year of lip colour for me. Therefore i’m really not used to bright lip colours. I tried Apocaliptic first and really was quite blown away by the colour. These actually remind me of Max Factor’s Lipfinity in appearance when first applied, however Lipfinity ‘dries’ ready to apply the separate topcoat whereas Apocalips stays fantastically glossy. 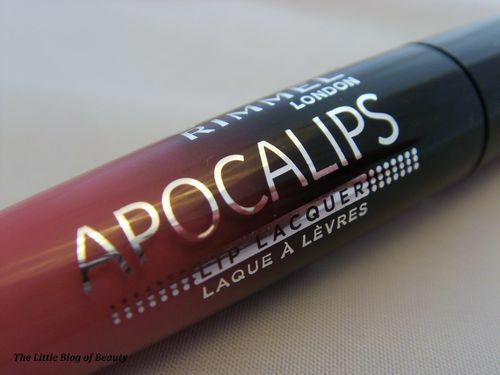 Apocalips don’t feel at all sticky or heavy, in fact you may forget that you actually have anything on your lips. If I remember correctly (if you read my blog regularly you will probably notice I have memory problems) I believe the glossiness stays put for up to a couple of hours but even once this has faded this leaves behind a stain of colour which pretty much stays put. So you won’t have to worry about re-applying for hours unless you want to replace the glossiness. One thing I did notice is that these can be quite transferable/smudge-able so particularly with the bright shades you may need to be careful with activities such as eating, drinking and kissing! 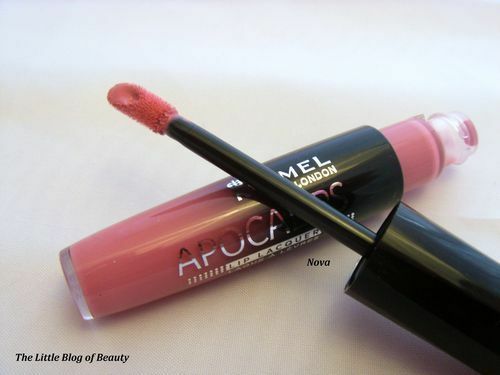 So overall I am very pleased with these and am glad I tried them and can see them becoming a staple in my year of the lip colour. 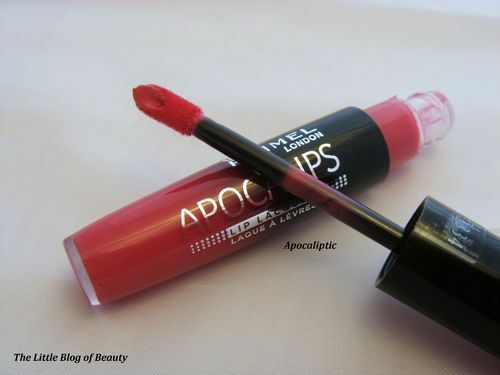 Apocalips are available from Boots and Superdrug for £5.99 each (and currently are on 3 for 2 in Boots) however I believe this is an introductory offer and at some point these may increase to £7.99.